Sticking with the class of store brand sodas we move on from HEB brand grape to HEB brand pineapple soda. The packaging is much of that like the grape, with the difference being a color scheme change. 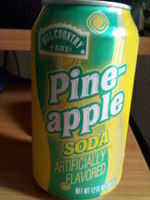 Overall it delivers exactly what you'd think a store brand pineapple flavored soda would. It's a bit too sweet for me to consider making it a regular drink of mine. If I'm thirsty and happen to have anything else in my fridge, I can see myself drinking the other most of the time. WE HOPE YOU ARE SATISFIED WITH THIS PRODUCT. IF NOT, WE WILL CHEERFULLY REFUND YOUR MONEY. Maybe it's just me, but I find humour in picturing someone returning this single can of pineapple soda. The 1950's style store clerk behind the counter smiles at them, then gets 40 cents, and hands it to the customer... never breaking gaze.